Used to frequent here a lot, but I haven't been here in years, and the memory of an excellent decadently rich tuna bianco thin crust pizza with onions, olives and drizzled with lots of olive oil brought me back. Sadly they don't make it anymore, so went with a different pizza this time around. Tucked conveniently in the University campus area, and with its own free parking out front, with a decent selection of wines, a good coffee bar, gelato counter, various panninis and pizzas, there's lots to choose from whether you're planing on snacking or having lunch/dinner. 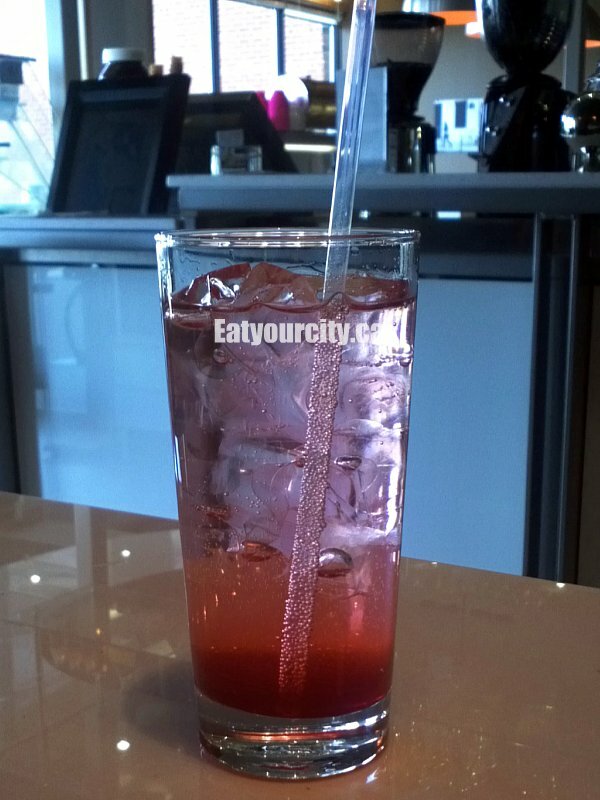 Service is similar to Famoso - you order, pay (and tip!) 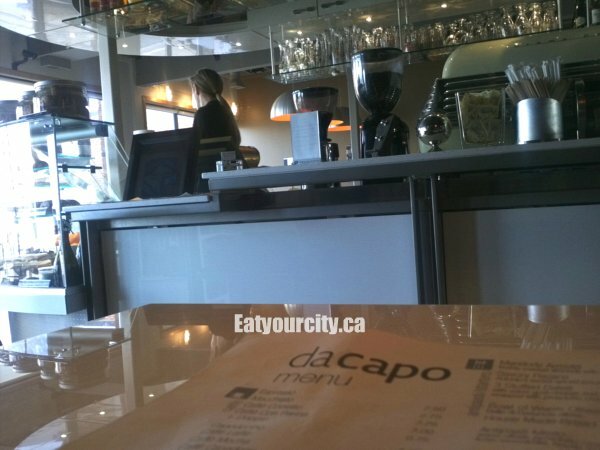 and the counter, you self seat, and the food is brought out to you. Its chilly out today, so I ordered what I thought would be a nice creamy thick drinkable hot chocolate. 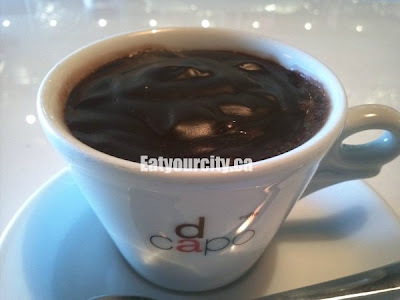 Da capo's version turned out more like a small cup of dark chocolate pot de creme as it was so thick, there was no way you'd be able to sip it. With an almost fudge like layer at the top, and smooth, creamy thick dark chocolate awesomeness, I easily forgave them for over thickening my drink. Eaten like it was a pot de creme - I treated it as a dessert than a drink. Despite being a small cup, it was a fair amount of dessert to finish off... got some help from my boyfriend! 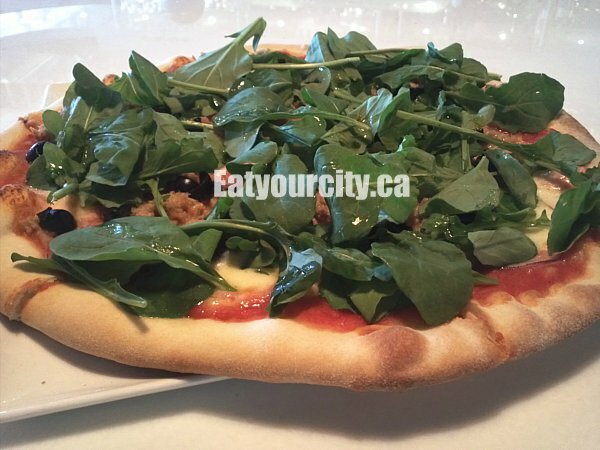 Advertised as tomato, mozzarella, red onions, olive oil-preserved tuna, arugula, black olives. 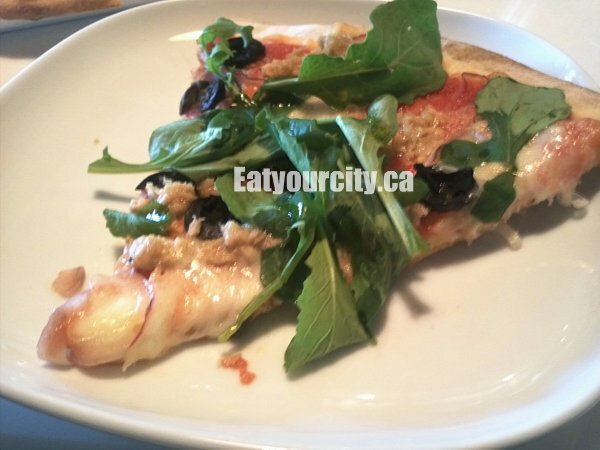 While nowhere near the bianco tuna pizza I remembered having a few years back with a thin tender crisp crust, and large chunks of tuna and olives adding in a rich and salt hit to the pizza, this one while good, was not a wow. The tuna was shredded a little which dried it out a bit as it baked - rather than left as large satisfying rich chunks. The tomato sauce cut much of the richness of the tuna, and while the crust was passible, it wasn't the olive oil infused tender crisp we were expecting. The crust could be much improved with incorporating more olive oil into it to up the flavor and tenderize it a bit as it resembled a pizza crust I could get from the grocery store. There was a few tiny thin strips of red onion between some blobs of good quality mozza and instead of arugula, fresh spinach was subbed on the pizza - didn't add much to the pizza other than some colour. 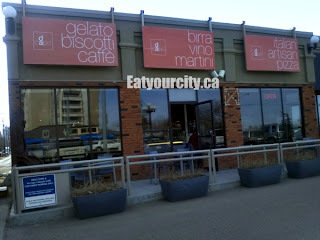 Overall a quick place to grab a quick salty, savory or sweet snack... bring back the old pizza dough! !